L: 48" x W: 18" x H: 32.5"
Margo Server w/ Wine Storage For a stylish dining room, look to the Margo server. This set lends a mid-century modern feel with its contrasting textures while it also features a 6-bottle removable wine rack and adjustable shelving. Plus, all the drawers are felt lined to keep delicate items safe. For a stylish dining room, look to the Margo server. This set lends a mid-century modern feel with its contrasting textures while it also features a 6-bottle removable wine rack and adjustable shelving. Plus, all the drawers are felt lined to keep delicate items safe. Well worth the price. Pretty sturdy. Shelves are adjustable/removable. Shelves are removable/adjustable with a screw driver from underneath. Perfect size and a great purchase price. We bought this server after purchasing the Margo 7 piece dining set. It’s solid and the design is mod and sleek. 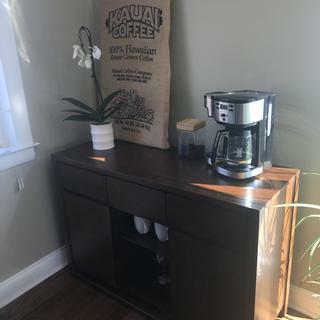 It is a great size (not too big, but definitely not small) and really compliments the dining set.My only complaints are that the veneer has some noticeable pattern repeating and I wish the wineracks could be modified to shelves. Are the inside wine shelves removable? BEST ANSWER: Hello Jesse, thank you for your interest in the Mango Server! Yes, the wine racks are removable. No, they aren’t. I wish they could be..